Ten years after they first met, Josh Beaton and Corey Jackson appreciate the fighting partnership that has enriched both their lives. 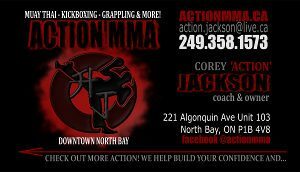 Once training partners at a North Bay kickboxing gym, Beaton and Jackson became fighter and trainer, and now are like father and son. 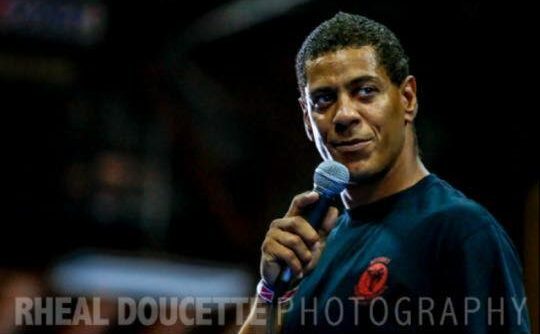 Jackson, 45, owns and operates the Action School of Fitness and Arts in downtown North Bay, and on Saturday afternoon as part of Mattawa’s Voyageur Days weekend, Beaton, 27, will fight Jeff Brown of Peterborough in a five-round Muay Thai fight. The event is called the Quest 5 for the Voyageur Title, and will feature other local talent, including Justin Condie, Albert Belanger, Troy Clarke and Nick Caruso. Deep in the basement of their gym, Jackson holds punching pads for Beaton while he practises the strikes he’ll be using in the fight. The men circle the gym, the silence punctuated by the pops of Beaton’s gloves and feet smacking violently into the pads. Jackson, expertly absorbing each blow, calls out the next combination to Beaton. The two circle each other, their pugilistic dance synchronized in complete harmony. Their focus on the task coming ahead of them is undeniable. Both are reflective of the first time they met, and how they’ve grown since then and arrived where they are now. “I remember telling Josh that there has to have been a reason why we met each other,” says Jackson. Beaton and Jackson met each other in 2006 at the Twin Dragons Gym, a former kickboxing haven popular in North Bay at the time. Beaton and a friend came into the gym looking for a place to train. Jackson, not yet a teacher, had been a member of the gym for five years. Jackson and Beaton quickly became close friends. They had experienced similar difficulties in life, and kickboxing was a way for them to escape demons and channel their energies into a passion that would be fulfilling. Having a training partner also meant they could hold each other accountable. “We kept each other from partying because we knew we’d have to get up in the morning, go into the gym and see each other the next day,” said Beaton. In 2009, the Twins Dragon Gym was closed. Over the next few years, Jackson, Beaton and a core group of fighters continued to train together. Jackson began giving combat instruction, using whatever space he could find to teach. “We trained in basements, we trained in barns,” said Jackson. Eventually in 2015, Jackson was able to obtain the Twins Dragon Gym space, making it into the new Action School of Fitness and Arts home. It was also during this time that Jackson began to train Beaton as a coach. Trusting each other completely, Jackson has guided Beaton to a 16 – 5 record, harnessing Beaton’s intense, no-holds-barred style. The two have also become family more in more than just the fighting sense. Beaton is in a long-term relationship with Jackson’s daughter Alex. They’re hoping their connection in and out of the ring will provide the foundation that will lead them to victory. “When we moved out on our own, we said, ‘Who knows where you’ll be five years from now,’” says Jackson.